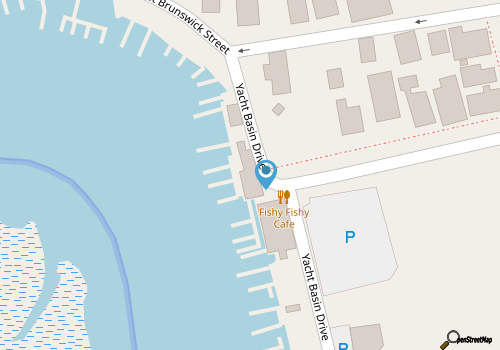 The Fishy Fishy Café is a favorite dining and drinks destination for Southport visitors, due to a prime location on the edge of the Intracoastal Waterway where the views are out of this world. Located next to a collection of local marinas, and featuring a seafood-heavy menu that matches the environment perfectly, this chic restaurant and bar is an ideal spot to enjoy a decadently colorful meal after a long day of exploring the heart of the Cape Fear region. Patrons will find two separate menus for lunch and dinner, and each mealtime has its own selection of traditional and more creative southern entrees that, more often than not, revolve around seafood as the primary ingredient. Lunch patrons can sink their teeth into a big sandwich, like the classic Rueben, Paradise Burger, or Bourbon Chicken Sandwich, or can appease a coastal appetite with the Baja Fish Tacos or seafood basket. Meanwhile, dinner patrons can munch on Low Country Crab Cakes, Salmon Creole, or Bacon Wrapped Stuffed Shrimp, as well as a modest selection of land lover fare, like Penne Rustica or a chicken tender basket. With lots of options and a wonderful focus on seafood, Fishy Fishy Café is a perfect complement to the Cape Fear region’s love of life on the water.